Second-year apprentice Jessica Matthews shares her journey into dairy grazing. This is the first of three blog posts. I had four day-old chicks nestled under a warm lamp in the spare room. This was my first small foray into animal husbandry, and I hadn’t realized before I brought them home that I’d need straw for bedding…oops. As I took to searching through classified ads on PASA’s website for straw, I stumbled upon Dairy Grazing Apprenticeship. I thought, This could be the opportunity of a lifetime! I’m an animal lover above all else, and the thought of working with cows for a living under the patient guidance of an experienced farmer seemed—despite having less than 24 hours of animal husbandry experience—perfect. I was seeking a career change, and the idea of farming had gotten into my head. I just couldn’t shake it. I had been dabbling in the idea by growing vegetables for several years, and now by introducing some backyard chickens into the mix. 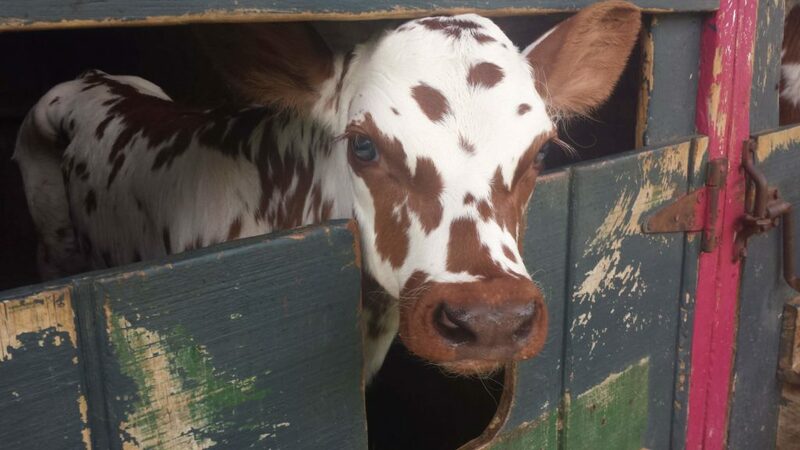 But there was no way to dabble in dairy farming—especially just outside of Philadelphia where I grew up. Exploring the Dairy Grazing Apprenticeship website some more, I discovered Hameau Farm, which is owned and operated by Master Grazier Gay Rodgers. Hameau’s website featured a grain silo painted by generations of campers who had spent their summers on the farm, red and white cows (which I had never seen before! ), and lush green pastures. I was in love. I created an apprentice profile and sent a gushy email to the owner Gay Rodgers (subject line: “Oh my god, you’re PERFECT!!!”). Gay invited me to her farm for an interview. During my interview with Gay, I knew I wanted to work with her. She was smart, quick, funny, gentle, and she obviously loved her cows. I was honest about my complete lack of experience working with livestock (I’ll have to ask Gay what she was thinking when I expressed this to her, but at the time she didn’t flinch). Gay encouraged me to stay on the farm for afternoon chores. It was the first time I had ever been so close to a cow—they were a lot bigger than I thought!—and the Birkenstock sandals I was wearing were not exactly farm-friendly footwear. Still, I worked alongside Gay through the afternoon and, in addition to meeting the herd, I met Hameau’s flock of sheep, hens, and calves. I discovered several bags of fluff in one of the calf hutches. “Is this wool? !” I excitedly asked. It was indeed—Gay had been looking for someone to put it to good use for some time. I had taken a spinning wheel class the weekend before, so took this to be a good sign. I committed to apprenticing at Hameau and spent the next few weeks overwhelmed and easily flustered. At times it felt like the only thing I was proficient at was filling water troughs—and even then I didn’t always do that right. 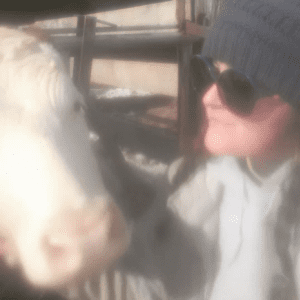 When I learned to milk, it was hard to keep track of getting all the cows cleaned, prepped, milked, then post-dipped…and finishing up at any kind of decent hour. It felt like nothing was ever going to click. Then, it seemed to happen all of the sudden. I got it. The rhythms and routines of a dairy farm gave me time to practice things until I got them right. I remembered to bring hose clamps and buckets and my water bottle with me when I had to walk way, way out into the fields (it took many thirsty trips until I got that right!). And I milked! I milked well! I learned to take my cues from the cows. If I stayed calm, they stayed calm. If I got stressed out, they got stressed out and kicked me. If I chased them instead of walked confidently beside them, they ran. In the wrong direction. I was learning to communicate with them while I demonstrated to them I was worthy of their trust. I took my cues from Gay, too. She was able to stay cool even in situations that were extremely flustering. One afternoon after helping her corner a runaway heifer in heat, I watched her calmly slip a harness on her. As she walked the heifer inside I asked her how she managed to stay so calm and patient. Gay told me, “It was something I worked really hard at.” I was glad to hear that. It meant it was something that I could work really hard at too. By the way, my chicks (chickens) now live at Hameau, where we have plenty of straw. 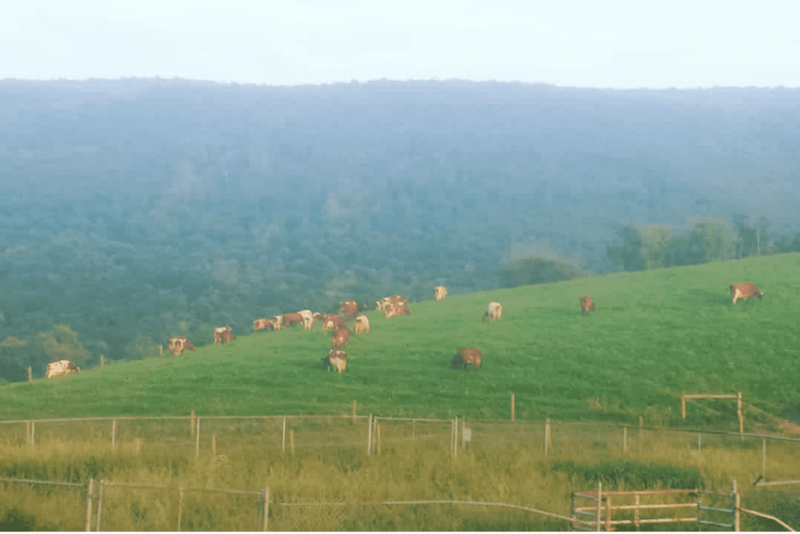 Stay tuned for Jessica’s next post where she’ll share her experience learning about—and responding to—the state of the dairy industry in Pennsylvania. Learn more about Dairy Grazing Apprenticeship.